Dancers of the world unite for World Kindness. On World Kindness day, groups from across the world join together to perform Flashmobs, thousands of people, dancing to the same song, at the same time, separated by continents but united through dance. All with one common purpose: to make the world a better place through dance. Marking its seventh year of global flash mobbing, founding company Life Vest, continue to donate gift funds to a non-profit in your local area: changing the lives of local citizens on an international scale. The best part: you don’t have to be J.Lo to participate. In fact, you don’t have to be a dancer at all! You, just have to want to change your community for the better. 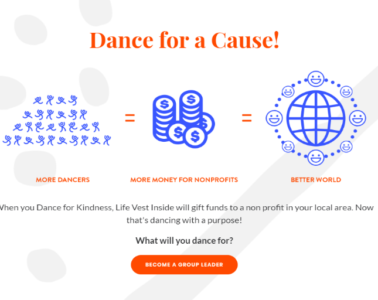 Last year’s event took place in over 120 cities, 50 countries with over 20,000 participants and whilst this year’s event is drawing to a close, you can now apply to take part in next year’s Dance for Kindness.